This deal expired 6 days ago . Expired 6d ago . Last validated 2wk ago . Used 5 times. Ramon I have tested this deal and it works as described, just apply the promo code during the checkout process to receive the discount. Jose Carlos I am validating that this deal works as described. Enter the promo code during the checkout process to receive this discount. There may be some exclusions that apply to this deal. Wisnellys Martinez I am validating that this deal works as described. 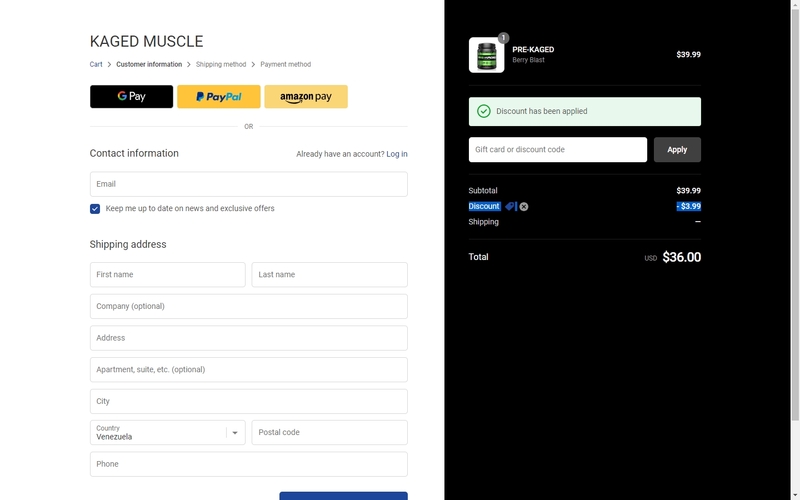 Enter code at checkout and get 10% Off Your Next Order at Kaged Muscle. Juan Luis Simply enter the code <dustin10> in the promo code box when checking out to get 10% off your next order at Kaged Muscle. This is a limited time offer. Certain conditions may apply.